AcroYoga is an integration of yoga, acrobatics and healing arts. A practice that cultivates trust, playfulness and community. At the same time a modern style as a tribute to ancient traditions. With its rich origins and creative nature the possibilities are infinite. From the more introspective, healing and listening to the more extroverted, expressive and joyful. 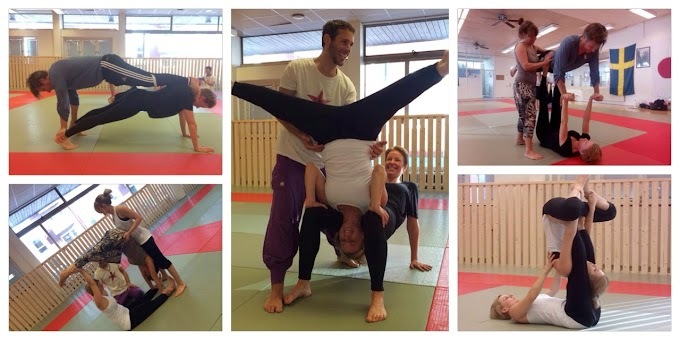 AcroYoga is an interpersonal type of yoga where we leave our own mat and practice together with others. * This workshop is open level. * You can come as a beginner or with experience. * The focus will be on exploring together and finding challenges for each participant. 300 kr för studerande/ arbetslös. Märk med ditt Namn samt Acro. Betalning kontant på plats är också möjligt men inte till early-bird-pris. Boris & Nina invite to serious playfulness and full presence. With their warmhearted pedagogy they make everyone feel included and rise to their own potential. Their diverse backgrounds spans from yoga, dance and kung fu to circus and theatre and they share a deep interest in movement and creativity with a life affirming attitude. On that path they found AcroYoga and got certified as teachers Level 1 and Level 2. Boris & Nina teach and perform together and are passionated about sharing the bliss of AcroYoga wherever they put their feet.